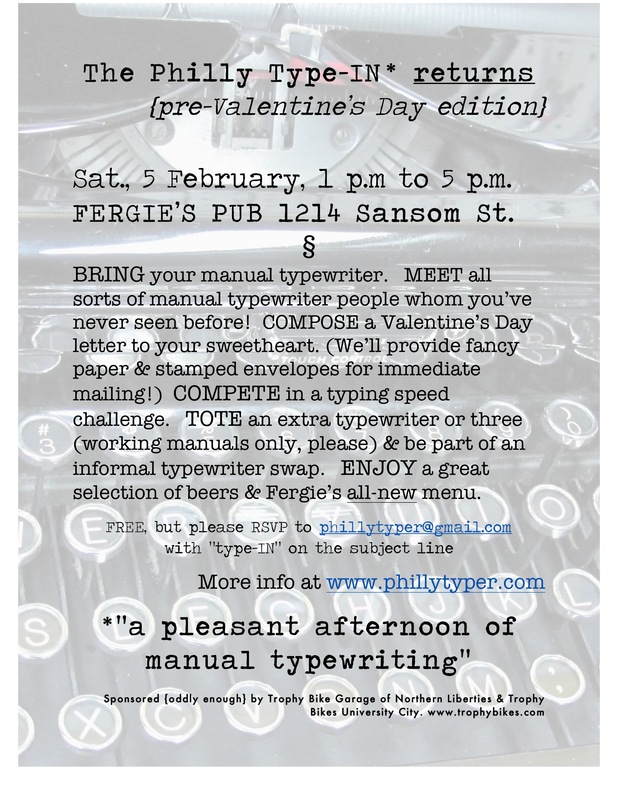 Philly Type-IN, Chapter Two--wherein we type up a nice Olivetti Valentine's Day note! OK, some updates. One, if you think you are going to win the Typing Competition Speed Challenge, you better keep practicing–word has it that Matt “Manyfingers” Cidoni will be coming to this second Type-IN. Matt dusted everyone at the last Type-IN with his brilliant command of the keyboard. So be on your game or get left behind. Two–What is a Typewriter Roll Call? Hint: you need a little paper and a lot of typewriters to accomplish one. And we aim to do a proper TRC at this next Philly Type-IN. If you can RSVP with the make(s) and model(s) of the typewriters you are bringing, that will help us a bit as we work over our detailed seating chart! RSVP to phillytyper@gmail.com. More than that we can not say. Finally, we’d really like to see a bit more swappiness on the 5th–Sooo… if you see a nice typer at a thrift store, or you’re looking to thin your herd, or get some new machines — do bring some extra typers to trade. Man, your Type-Ins have really started something. I’m sure you’ve heard about the one in Pheonix. Today my wife and I were talking the owner of a used bookstore here in Snohomish, Washington. She really wants to host a type-in. She loooooves your idea of centering it around Valentine’s Day, so we’re going to do it on February 12th. Thanks for inspiring this cool movement of type-ins. Right on, or whatever it is they say nowadays! Yeah, used bookstore owners for some reason, often are typewriter owners. Make sure they have (or you borrow) your standard folding table, like at church suppers and etc. — a group of even a dozen typer-types can use up all the available flat space pretty quickly. Also, if you’re having a Type-Off or any sort of competition, it looks cool to have ’em all clanking away at once along a big table. Hey, this is a hoot and a half watching all these things spring up… no two alike. cheers and take some pics or vids ot the Snohomish Affair (sounds like an old Man From U.N.C.L.E. episode) and post them up.